Nyman’s Jewelers began back when Eric Nyman returned from Korea. He went to school at the Bradley University School of Horology in Peoria, Illinois. He graduated as a master watchmaker and subsequently started his career in Kalamazoo, Michigan. Later, he went to work for Mackie Jewelers in Sault Ste Marie, Michigan. It was there that Eric heard of that Feldstein’s, a jewelry store in Escanaba, Michigan, was for sale. Manny Feldstein had passed away and his widow Ann wanted to sell the business. In October of 1968, Eric and Betty Nyman bought the store and moved their four daughters to Escanaba. The eldest three girls were enrolled in school but the youngest daughter, Sue, was not yet old enough to go to school. So, Eric and Betty brought Sue to work with them! This is where Sue’s career in jewelry first started. At the age of three, she got pretty good at cleaning the glass on the showcases. During this time, the original location of Nyman Jewelers was at 910 Ludington Street. In 1972, Eric and Betty bought the former Blomstrom and Petersen store, packed up and moved across the street to their current location of 911 Ludington Street. 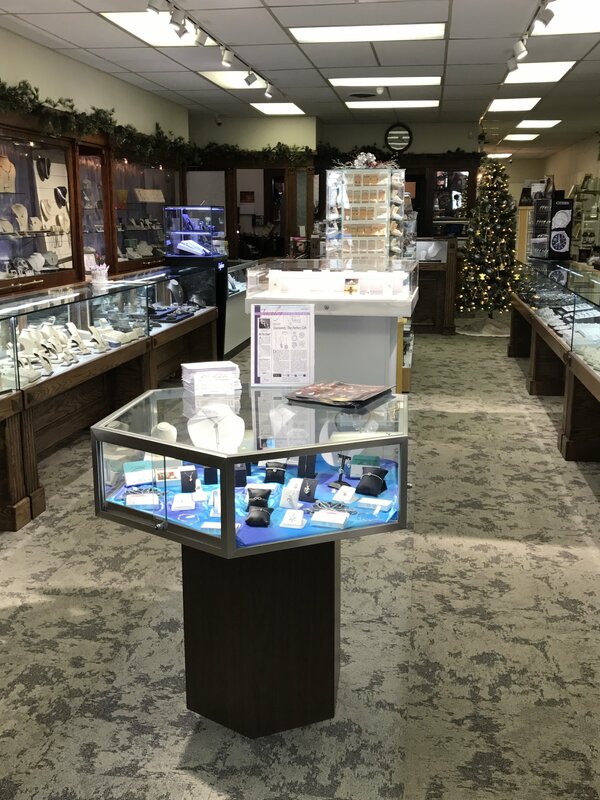 Since then, Nyman Jewelers has continued to enjoy serving the jewelry needs of their customers and providing a friendly, knowledgeable environment. Some things have changed, though. Betty Nyman loved the store and worked here until illness made it impossible for her to do so. Sadly, Betty passed on in the summer of 2006. She is remembered and missed, and her memory lives on in the hearts of the Nyman family and its friends and customers.